Where did this even come from? Earlier this year, the LA Film Festival premiered a film called Paper Man, that starred Ryan Reynolds as a wanna-be superhero. 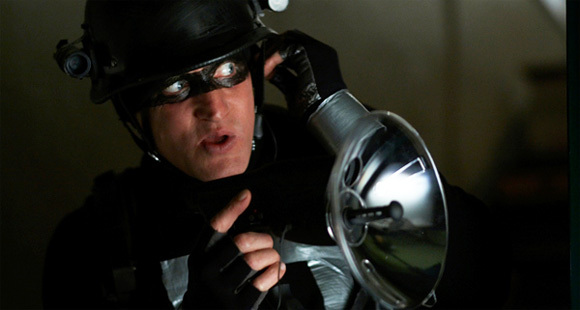 Now along comes Defendor, which is premiering at the Toronto Film Festival, also comedy starring Woody Harrelson as a wanna-be superhero. Some photos have popped up online for this courtesy of both TIFF and SlashFilm and it looks pretty damn good. 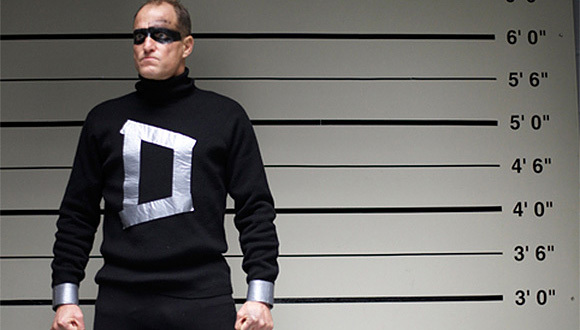 At least the costume Harrelson made looks great, especially the duct tape D on his chest. 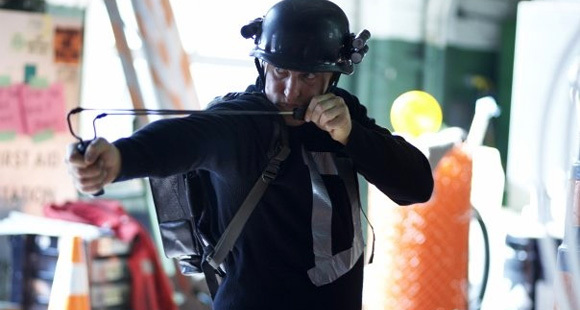 Defendor is both written and directed by actor-turned-filmmaker Peter Stebbings. Anyway, I've said enough, juut check these out! Reality intersects with delusion in the mind of Arthur Poppington (Harrelson), a regular man who adopts a superhero persona known as Defendor, and combs the city streets at night in search of his arch-enemy, Captain Industry. In his attempts to combat crime and bring down Captain Industry, a drug and weapons dealer who he mistakenly blames for the death of his mother, Defendor ends up befriending a young prostitute named Kat (Kat Dennings). Armed with unconventional weapons of mass confusion, aided by his new friend, and putting his life on the line, Defendor proves that everyone is capable of making a difference. 1st. Reminds me of "Special". kinda of like Special but I have hopes for this Harrelson is always great, and I'm liking Kat Dennings in this, so count me in! i enjoyed "special" so, i hope this turns out good too. hahaha. looks very funny and touching. i'll keep it on my radar. cant go wrong with harrelson, one of the most underrated actors ever! hopefully a better story than special or blankman though. WOODY'S BACK BABY! FIRST ZOMBIELAND AND NOW THIS! IT'S ABOUT TIME!!! reminds me of "special" which was great!! I wouldnt be interested in this if it werent for woody. hope its as good as "special"!